This month, I’ve decided to combine two months’ worth of Licorice of the Month Club fare into one big happy post. The reason for this is twofold – first of all, with the holidays I’ve been absurdly busy, and second, the two candies I’m profiling are red versions of black licorice I absolutely love. To be entirely honest, I’m not sure how true to an actual raspberry taste it is; I’ve avoided the fresh berry ever since I was a kid and had a mild allergic reaction to them. However, I can tell you it’s very sweet, almost to the point of overpowering. It doesn’t have that icky waxiness so endemic to Twizzlers and other such candy, though, so if you really like red licorice, this would probably be right up your alley. 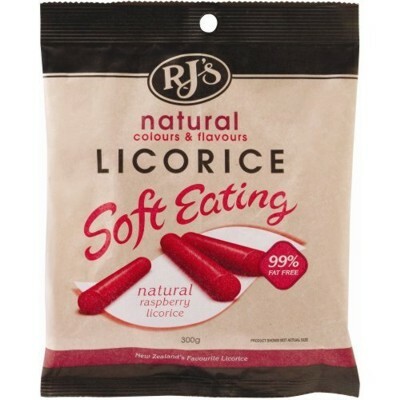 Next up is the red cousin to my absolute favorite black licorice, RJ’s Natural Licorice. I’ll tell ya, there’s a good chance I’d give up my first born to get a year’s supply of the black variety. Ok, maybe not a year… but definitely a lifetime supply! Anyway, on to the red. My first impression of these is somewhere along these lines: “Ew! It’s sticky! Get if off my fingers! Help!” Once I’m over that unexpected development, I get on to the tasting. Actually, it isn’t bad. Unlike the Black Opal, this is pretty darn mild. Sweet, yes, but not overly so. It has definite berry-like undertones, but it doesn’t smack you in the face with the flavor. The only real gripe I have (aside from the stickiness) is that the pieces aren’t as soft as the black version. Indeed, with the width of these red pieces, they can actually be a little difficult to chew. Still, if you’re fine with that, you can’t go wrong with the flavor. As an extra little bonus, I got an RJ’s black licorice log. It’s basically identical to the candy in the bag, but in a larger one piece log form. 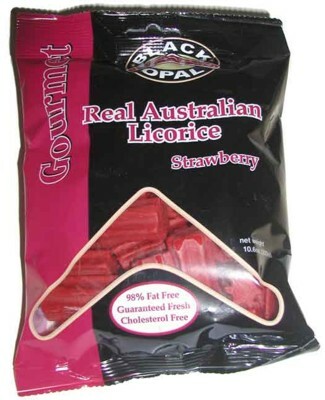 You just can’t go wrong with this licorice! I stumbled across this blog looking for candy sites. My grandfather was a candy salesman through the depression and up until the 80′s. He, as well as many candy connoisseurs will argue the only thing you can call licorice is black licorice….the other is red chewy candy. Just thought I’d add my “penny candy thoughts”. Oh, that’s definitely how a lot of people feel. However, the red licorice is in fact made in almost an identical fashion to the black, which I suppose is why it acquired the moniker. Still, it’s a debate that continues to this day. What an interesting licorice fact! I never knew that! Here in The Netherlands this definitely isn’t called liquorice (or the Dutch word: drop). That’s reserved for the black kind, this red stuff looks like ordinary sweets/candy to me. It’s probably due to the fact not a lot of people eat liquorice outside of The Netherlands and a few other european countries (most find real liquorice disgusting, especially the salty kind). I aam looking for Tar Bar. Havaen’t found it since the Nut Tree in Vacaville, California closed. I still have one tar bar in the fridge. I was hoping to purchase more during my current trip to the US like I did years ago when I bought an entire box of them (at a $1 each). I did not know that they (nut tree) went out of business quite some time ago. Why doesn’t some one make them again! The tar bar is no longer. The nut tree closed AGAIN Jan. 2009 after reopening some yrs back. I have never seen the tar bar since it was at the Nut Tree. It was the best. I’ve been looking everywhere (almost) for Black Opal Licorice Allsorts. They seem to have vanished. Target used to sell them by the bag, then they were available online by the box and now they seem to have disappeared. Any ideas on where I can get them would be appreciated! Thanks.